In order to capitalize on the third Spider-man and the storyline used, Marvel Comics returned everyone’s favorite web-slinger to his darker costume in a “back in black” storyline. 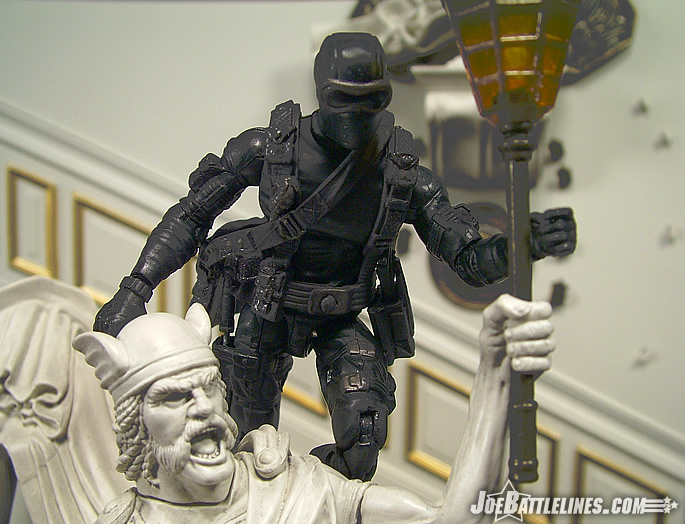 In many ways, that’s how I feel about Hasbro’s decision to re-release the 25 th Anniversary battle pack Snake Eyes in his original color scheme. When the original figure was released, many fans questioned the choice of the charcoal gray color scheme. 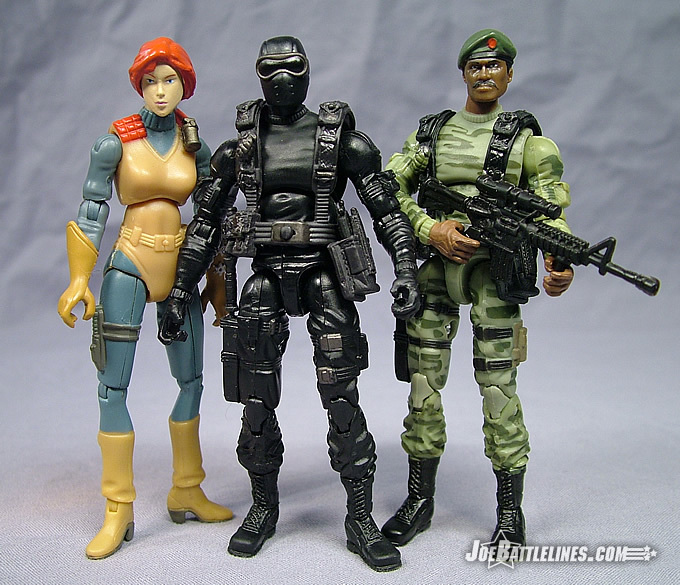 After all, if this was an anniversary line dedicated to reproducing classic character designs in updated style of character construction, why was Snake Eyes not released in his signature togs? Hasbro listened to fan feedback and, in a cost-effective move, released the figure in his familiar colors. So, how does this figure weigh in compared to all of the other releases? Read on, and find out one Joe fan’s opinion. This is going to be a fairly brief review for the simple reason that there are only two differences between this figure and all of the other releases this character design has seen in the anniversary line thus far. First, this figure is molded entirely in black plastic with only a few paint applications used to provide contrast and highlight some molded details. Secondly, this figure features the updated “shaved crotch” as some fans are calling it. I’ll start with the color change first. Aside from the use of some gray paint on the edge of the molded goggle as well as on the buckles found on the character’s left thigh, this figure is completely devoid of paint applications. 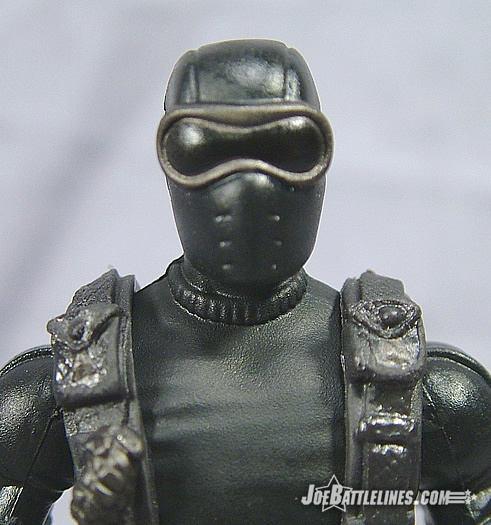 It’s quite possibly the closest that Hasbro has come to replicating the original release of Snake Eyes from 1982 yet. 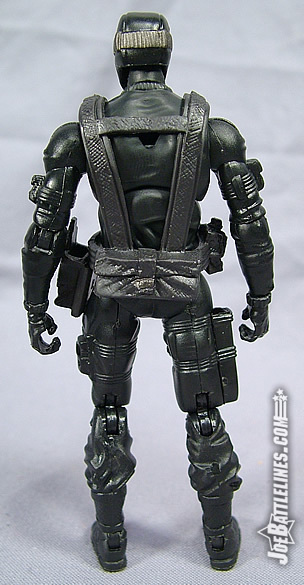 Many times, the temptation seems to have been to release a black Snake Eyes and then cover the figure with various paint applications—painting in the belt, harness, buckles, or goggles in order to add some contrast to a “sea of black”. The only problem with such extra applications is that they really do fly in the face of the spirit of the original release. 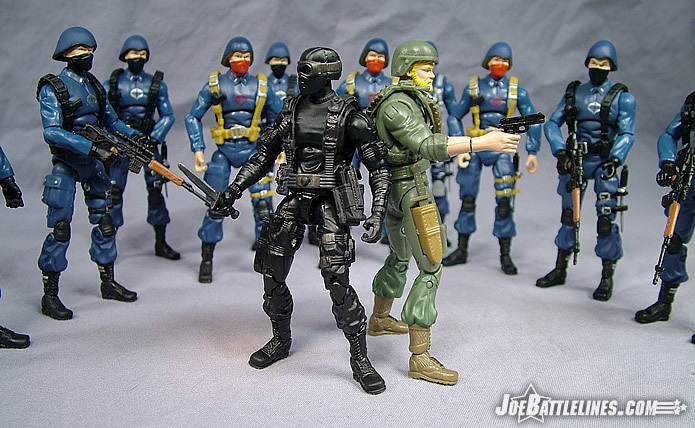 Snake Eyes’ original color scheme was a cost-saving move that proved to be extremely effective in defining a particular character. His all black look was an attempt to minimize the total number of paint applications used for the debut wave of the A Real American Hero line—it wasn’t done intentionally to crazy the “ultimate ninja warrior” or any other such nonsense. However, it worked and it worked extremely well. 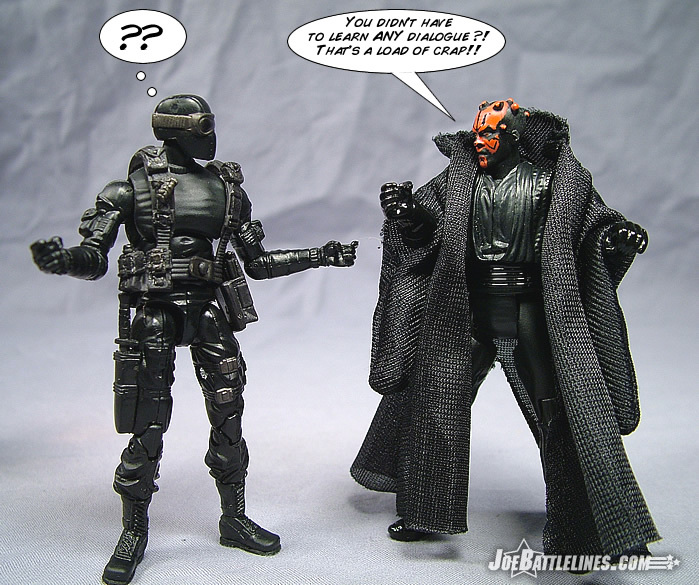 The figure’s all black look became a staple of the character’s design and subsequent versions of the original character that deviated in any degree from the original color scheme were met with scorn and disdain by many collectors. Hasbro wisely brought the character back to his “design roots” with this release—a move that has obviously proven an effective sales tool as evidenced by the fact that I have only seen this figure on the pegs once since his release in December 2007. 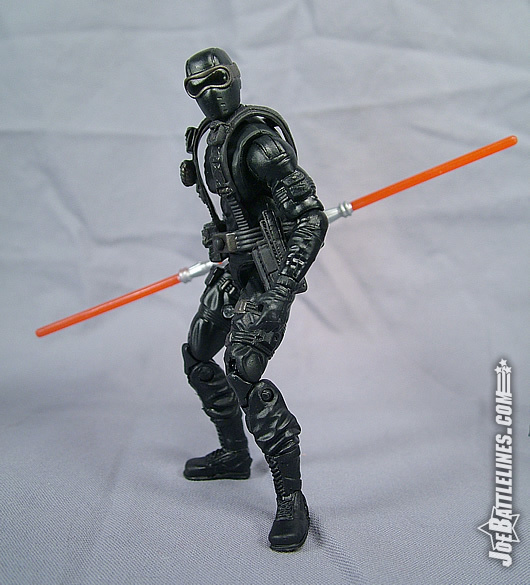 The other area in which this Snake Eyes figure deviates from the original 25 th Anniversary release is evident in the changes to the tooling of the figure’s waist. The previous version of the character suffered from what many collectors referred to as “diaper crotch”. 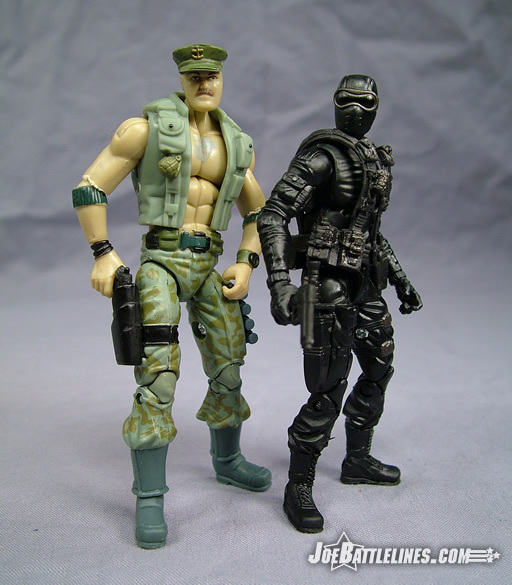 Hasbro seemingly placed “form over function” with this line at its inception and released the debut figures with a waist design that offered a much more limited range of motion than the classic ARAH era figure or even the more recent GvC series. The figures, when compared to their counterparts, couldn’t sit and had a much more limited range of motion at the hips. While a minority of collectors didn’t appear to have a problem with this limitation, a vocal majority voiced their dissatisfaction with this apparent oversight. 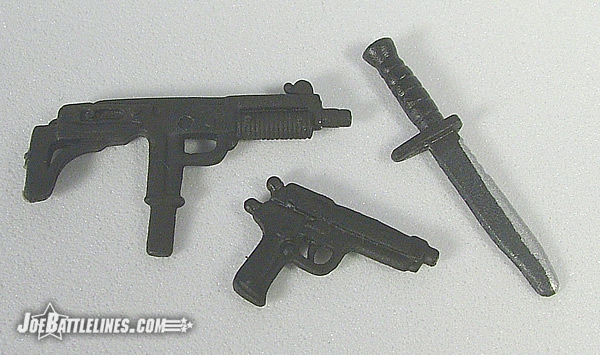 After all, these were anniversary versions of “fully poseable modern army figures” not “semi-poseable mini-statues”. 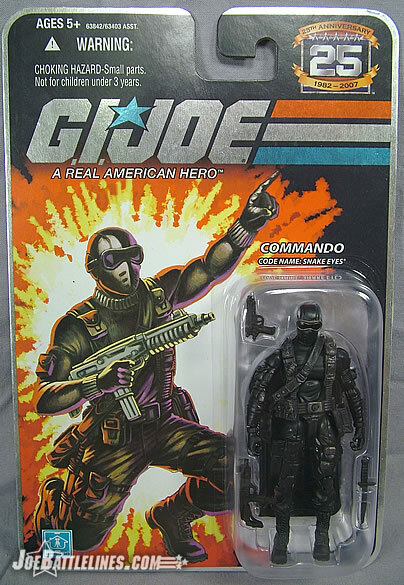 Some fans pointed to the various McFarlane toy lines which were infamous for their emphasis on design almost entirely over articulation and pleaded with Hasbro not to move the Joe line into that direction. After all, many figures were plagued with what has become known in some circles as “Duke arms” or elbows that couldn’t bend a full 90 degrees. Why must the waists be subject to the same design oversight? Thankfully, Hasbro came though again and shaved down the excess plastic around the character’s hips, offering a much greater range of motion. 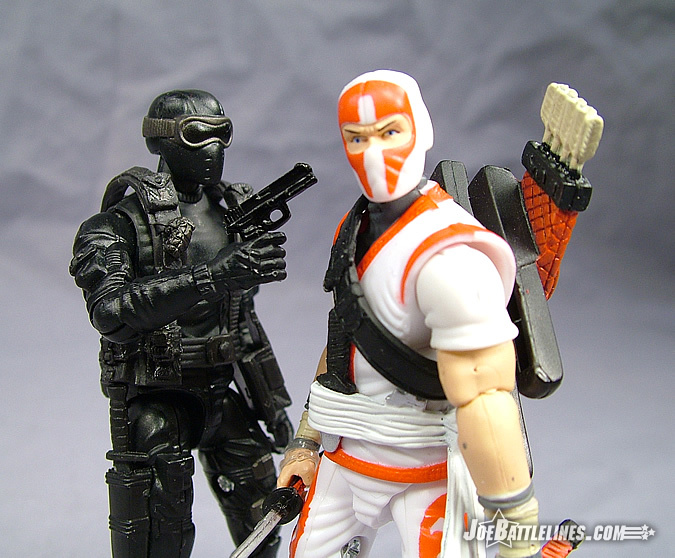 Not only has the battle pack Snake Eyes been offered in single carded form but his range of motion has been dramatically improved.